Optics are the greatest force multiplication tool you can put on a rifle, period. 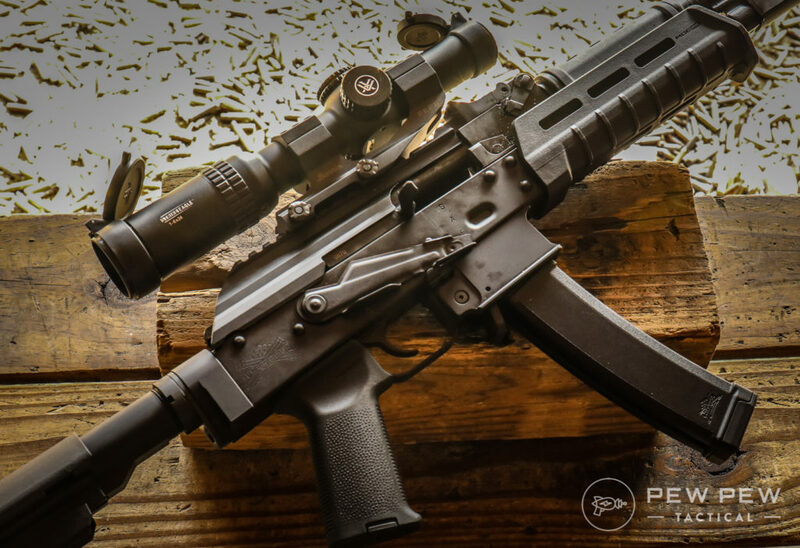 Low power variable magnification optics have been around for a while now and people have mostly settled on the 1-4x and 1-6x as being the two most popular ranges for competition, plinking, and tactical work. Today, we’ll take a closer look at one of the most popular – the Vortex Strike Eagle 1-6x. I’ll run down the features, pros and cons, and give you some recommendations for mounting systems so that you can decide if the Strike Eagle is right for you. Now, also a video review! 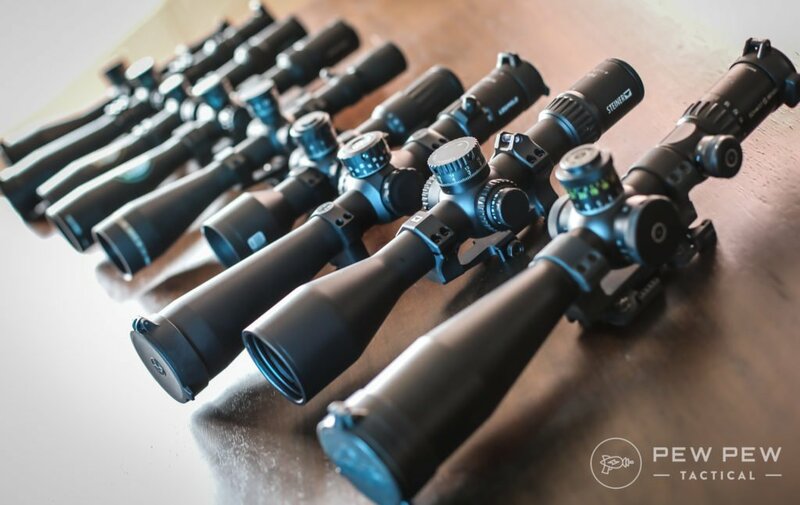 There are a number of great 1-x scopes on the market, but right now we’ll look at one of our favorite 1-6x scopes in our Best 1-6x Scopes article. Vortex is well known for their quality glass at reasonable prices, from their budget tier Crossfire II line to their very high-end Razor HD line – Vortex delivers at every price point and for every kind of shooter. If you’re looking for a decent price, mid-range variable optic then the Strike Eagle demands your attention. Just because this is a mid-range optic, doesn’t mean that it is without some features! Illuminated reticle, BDC markings, capped turrets in 1/2 MOA clicks, raised adjustment fin on the magnification adjustment ring. Okay, some of these are more exciting than others. 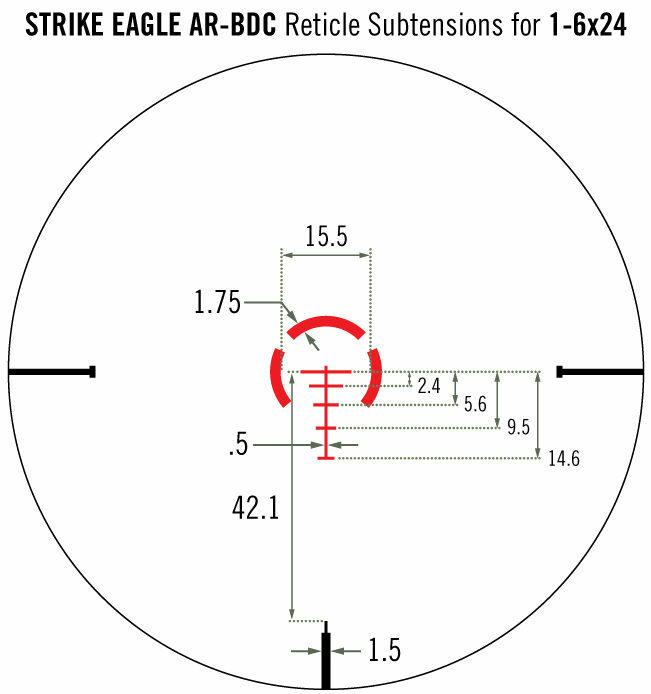 The two main ones are the illuminated reticle and the BDC markings in the reticle. 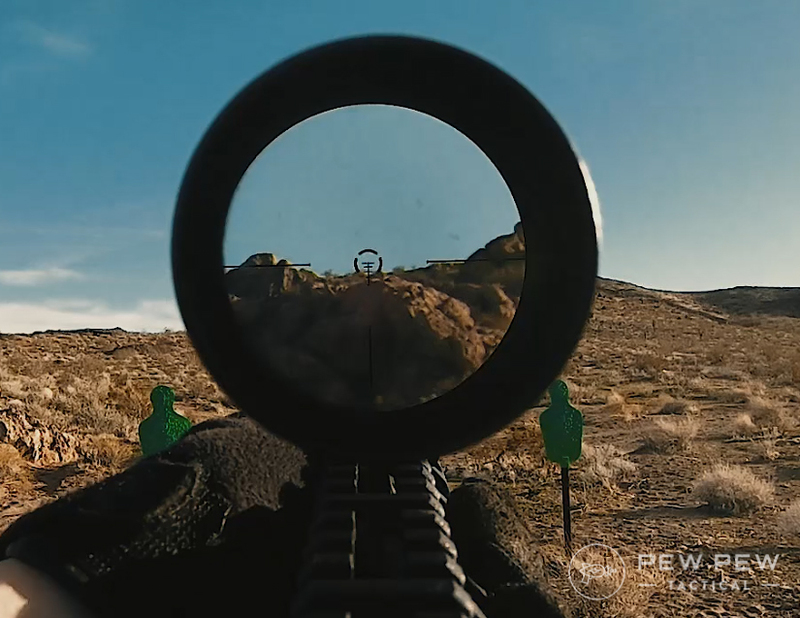 While being fairly simple, the reticle does work as intended and give you several useful options using it. First, the rings on the outside act as a “Donut of Death” for when the optic is in 1x mode and you have close targets that just need to be sprayed down (common in several types of competition). The inner lines are great for mid-range targets that need a more precise shot. However, due to the Strike Eagle being a Second Focal Plane optic – your BDC will only be calibrated at the max magnification. The zero will be useable on any magnification, but if you want to reach out using the BDC you’ll need to be on 6x. Personally, I found the BDC to be very accurate out to at least 250-yards with Wolf Gold 55gr, but your ammo and rifle will produce different results. A little bit of testing on the range and you can find exactly how your BDC line up with your rifle! For the budget minded, Vortex delivers some of the best glass for the lowest price on the market and the Strike Eagle is a great example of that in action! At 1x there is almost no distortion until the very outside edge of the optic, since this is designed to be used inside of about 100-yards it in no way really impacts the shooter or your ability to make hits. Turning the scope up to 6x will increase the distortion, but still doesn’t limit your hits out to 300-yards or so. 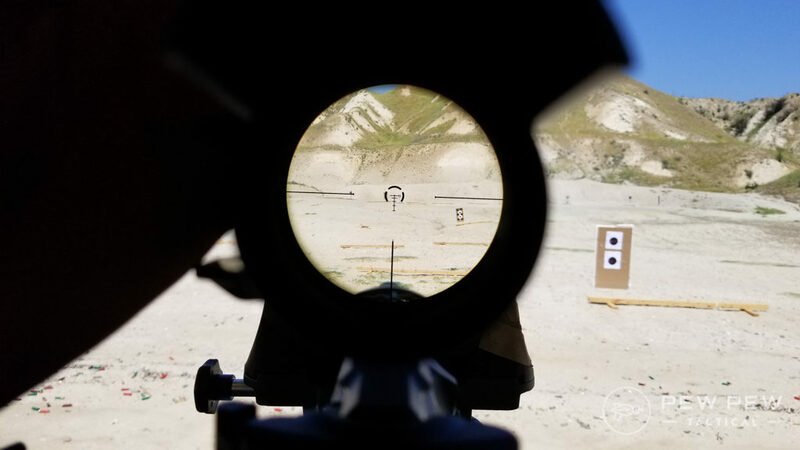 Past that, and hits start to become a bit harder and if you’re planning on reaching past 500-yards this might not be the right optic for you. Adjustments are simple and basic. 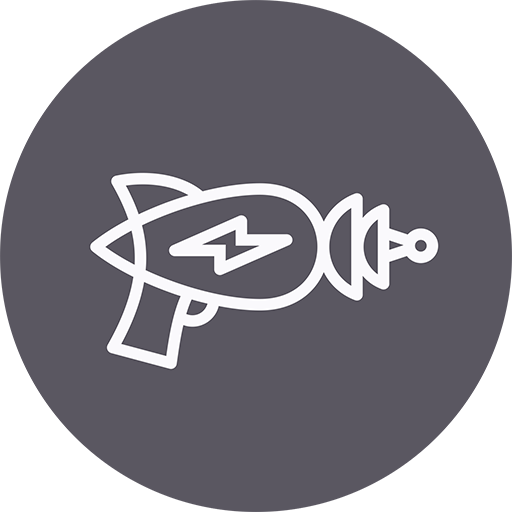 The capped turrets give 1/2 MOA clicks with a max range of 140 MOA in both elevation and windage. Since they are capped though, you won’t be adjusting them on the fly – but that isn’t really what the Strike Eagle is designed for anyway. These are meant to be set and forgotten, using the BDC for enhanced range combined with some old fashioned Kentucky windage. One major plus though is that Vortex ships these with scope covers already installed, you can take them off if you want to – but I’ve found them to be very handy and perfect for protecting the glass while in a gear bag or safe. Being a 30mm tube, it’s not hard to find mounts for the Strike Eagle. We have a few favorites though! 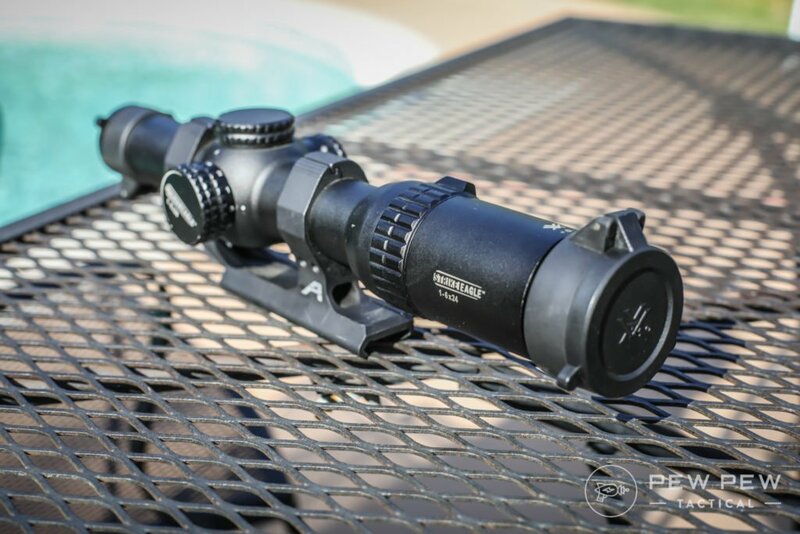 If you’re looking for lightweight and plan on keeping the scope on the rifle for a while, the Aero Ultralight is a great mount and a great price. Need more Picatinny? Well, if you do – Burris has you covered. Thankfully, they also ship with normal top rings so you can have the option of Picatinny tops or not. And this QD comes in at a much lower price than most QD mounts. If you’re ready to spend a bit more money but getting a VERY robust mount – you can’t go wrong with Midwest Industries. Positive engagement of the QD latches and a highly durable mount make for one of the best QD mounts around! We’ve used our Strike Eagles across many thousands of rounds and on rifles in 5.56 NATO, 7.62×39, 9mm, .308, 6.5 Creedmoor, and more – we’ve taken them on flights, dropped them in range bags, and generally treated them as the tools they are designed to be. Through all of it, we’ve never had a problem. Personally, I would like the small fin on the zoom adjustment to be just a little larger or for the ring itself to feature some rubberized grip. That said – it is fairly easy to adjust and Vortex does offer a throw lever built just for the Strike Eagle if you want it. You can have your scope in any color you want, as long as it’s black. There isn’t much to say about the looks, but I like it. As customizations go, the Strike Eagle offers what you need. Scope caps come standard, so that is nice. A throw lever is easy to get since it is sold directly by Vortex. 30mm tube means LOTS of mounting options. That is really everything I could want to customize with a scope of this kind, so it gets a top score. The normal price for the Strike Eagle is a very fair offer since you get a lot of scope for not a lot of money, but sales on the Strike Eagle happen fairly often and can make for some AMAZING prices – whenever we see it on sale, we make sure you put the word out by including it in our Daily Deals page! 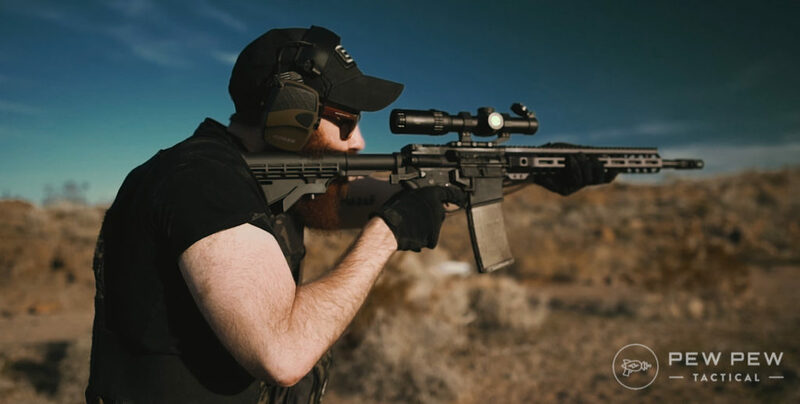 While there are a lot of optics options for the AR-15, the Strike Eagle is a great general purpose scope and outstanding for getting in the door of competitive shooting. It doesn’t do everything, but it does a lot of things really well. Thank you for the review. Can this be used on a 308? I have a Springfield Armory Socom 16. I am looking for a scope for the rifle. Yup, I’ve had it on a .308 for a while and it’s held up. Depends on how you want to mount it. Traditionally M1A’s have to have long eye relief scopes because of the mounting position. They make adapters that will make most scopes work but will really change how the rifle looks. Recoil wise this scope should be fine though. Caliber specific reticules should be matched to what you have if you want to use that feature. Could I use this on a ruger PC Carbine? Short and to the point. Accurate review based on my experience. 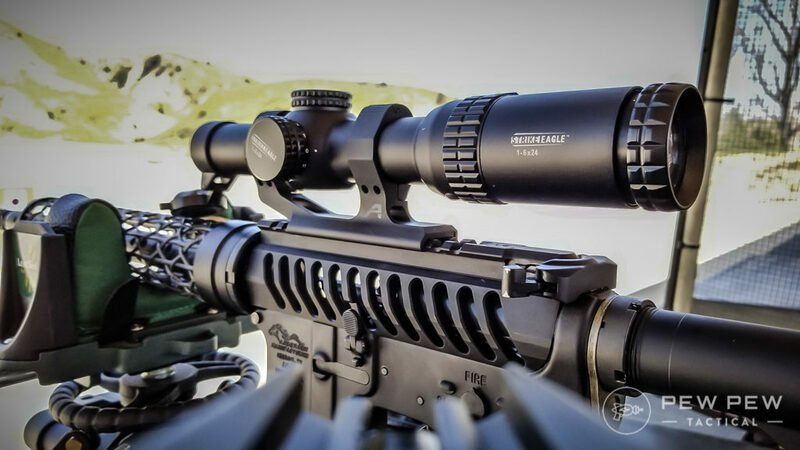 Vortex is a good starting point for an optic and in most cases a good stopping point as people progress. Good value for what 99% of us actually need.